Take the ultimate Grand Canyon tour! You'll fly from Las Vegas to the Grand Canyon by helicopter, cruise the Colorado River, then spend time at the West Rim. You also have the option of choosing the Grand Canyon Skywalk for 360-degree panoramic views. 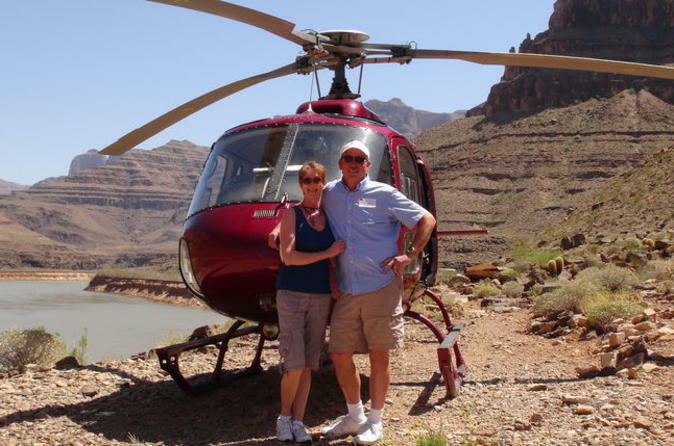 Your Grand Canyon adventure begins with a limousine transfer to Las Vegas Airport to catch your 45-minute helicopter flight over the Nevada and Arizona desert to the Grand Canyon West Rim. The helicopter flight includes commentary and major landmarks are highlighted along the way, including the Colorado River and Hoover Dam. Arriving at Grand Canyon West, you'll descend 4,000 feet (1,200 meters) below the rim to land by the Colorado River and take a 15-minute narrated boat ride. You'll then ascend to the Grand Canyon West Welcome Center and board a shuttle bus to explore the top of the canyon. At the end of the day you'll fly by helicopter back to Las Vegas, including a pass over the famous Vegas Strip. On landing your limousine will be waiting to return you to your hotel. Truly the ultimate experience, flying from Las Vegas to the Grand Canyon where you'll cruise the Colorado River and then spend time at the West Rim. To complete your Grand Canyon experience, you also have the option of choosing the Grand Canyon Skywalk for 360 degree panoramic views. There is a maximum capacity of 6 people per helicopter plus your pilot. The boat portion of the tour may be cancelled due to high water levels in the Colorado River. In the case of a cancellation, extra time at the base of the canyon will be offered or a partial refund will be issued.